(June 14, 1945) -- Lt. William Fredericks, 27, of the Army Air Forces, a B-29 co-pilot was listed as missing in action after a raid on Guam in the South Pacific. He is the son of Mrs. Ruth Fredericks of Montgomery Place. Lt. Fredericks entered the service in 1940 as a member of the National Guard. He was assigned to the 44th Division Field Artillery, and transferred to the Air Corps in 1941. His brother Coxswain Harry C. Fredericks was killed in action in in the Gulf of Mexico on May 19, 1942. It was the first reported Belleville Gold Star casualty of the war. (May 23, 1946) -- Lt. William Fredericks, who was declared missing in action a year ago May 5, has been declared killed in action. Lt. Fredericks was the co-pilot of a a B-29 shot down over Kyushu, Japan. The pilot of the plane was found alive as a prisoner of war held by Japan. Lt. Fredericks leaves a wife and 8-month-old son, William Jr. 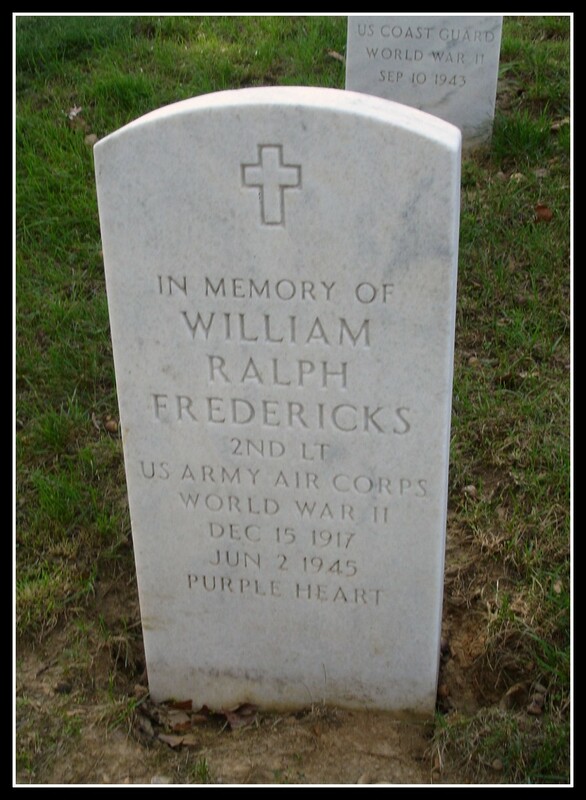 According to the American Battle Monuments Commission, 2nd Lt. William R. Fredericks, U.S. Air Forces serial No. 0780565, served in the 6th Bomber Squadron, 29th Bomber Group, Very Heavy. He entered the service from New Jersey and was declared killed in action on June 2, 1945. He is listed on the Missing In Action or Buried at Sea Tablets of the Missing at Honolulu Memorial, Honolulu, Hawaii. He was awarded the Air Medal and the Purple Heart. Memorial headstone, Arlington National Cemetery, Arlington, Va.